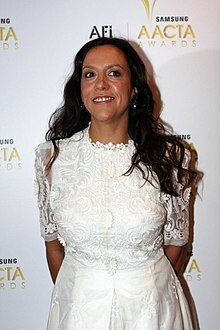 Rachel Perkins is an Australian film and television director, producer, and screenwriter. She is known for her films Radiance (1998), One Night the Moon (2001), Bran Nue Dae (2010), and Jasper Jones (2017). Perkins is an Arrernte woman from Central Australia, who was raised in Canberra by Aboriginal activist Charles Perkins and his wife Eileen. Perkins was born in Canberra in 1970. She is a daughter of Charlie Perkins and granddaughter of Hetty Perkins, and has Arrernte, Kalkadoon, and German ancestry. Her sister is Hetti Perkins, an art curator. Her brother is Adam PERKINS. For schooling she and her sister attended Melrose High School. At the age of 18 Perkins moved to Alice Springs and entered into a traineeship at the Central Australian Aboriginal Media Association. In 1992 Perkins founded Blackfella Films, a documentary and narrative production company creating distinctive Australian content for television, live theatre, and online platforms, with a particular focus on Indigenous Australian stories. Its productions have included multi-award winning seven-part documentary series First Australians, television film Mabo, and TV series Redfern Now. She served as Commissioner with the Australian Film Commission from 2004 to 2008, and since 2009 has been on the board of Screen Australia. She was also curator for the 2009 Message Sticks Indigenous Film Festival. This tenth anniversary of the festival held at the Sydney Opera House featured the premiere of Fire Talker, a documentary film about her father Charlie Perkins by Australian filmmaker Ivan Sen. Since 2015, Perkins has been the president of the AIATSIS Foundation, which is part of the Australian Institute of Aboriginal and Torres Strait Islander Studies. Perkins has a son, Arnhem, with her ex-husband filmmaker Richard McGrath. ^ a b Melbourne, The University of. "Perkins, Rachel - The Encyclopedia of Women and Leadership in Twentieth-Century Australia". www.womenaustralia.info. Retrieved 10 March 2016. ^ a b "Blackfella Films". Official site. Australian Broadcasting Corporation. Retrieved 27 May 2013. ^ "SBS Film – Spreading the message by Mary Colbert". ^ "ABC Sydney – What's on This Weekend – SATURDAY 9 May – FILM FESTIVAL". Archived from the original on 11 September 2009. ^ Slattery, Claire (18 October 2016). "Foundation launches million-dollar plan to record Australia's songlines". ABC News (Australian Broadcasting Corporation). Retrieved 27 October 2016. ^ "A Foundation for all Australians". The Australian Institute of Aboriginal and Torres Strait Islander Studies (AIATSIS). 14 May 2015. Retrieved 27 October 2016. ^ Dow, Steve. "Rachel Perkins on Jasper Jones and Indigenous activism". Saturday Paper. ^ Mengel, Noel. "Hurt and healing voiced". Courier Mail. ^ Munro, Kate (28 November 2014). "First Contact producer Rachel Perkins: 'Prejudice often comes from ignorance … people can change'". The Guardian. Retrieved 27 October 2016. ^ Dow, Steve (28 January 2017). "Rachel Perkins on Jasper Jones and Indigenous activism". The Saturday Paper (Australia). Retrieved 28 January 2017. ^ Windsor, Harry (13 February 2017). "Screen Australia backs new projects from Jocelyn Moorhouse, Leah Purcell". If Magazine (Australia). Retrieved 15 February 2017. Wikimedia Commons has media related to Rachel Perkins.